West Midlands, UK - Cashmores, a large stainless steel and aluminum stockholder and coil processor located in the West Midlands, announces the installation of its new Edge Conditioning and Servo Traverse Coil Winding System at its West Midlands, UK facility. The equipment was designed and manufactured by Stanat Precision Machine Company, Schiller Park, IL., USA. The De-Burring and Servo Traverse Winder System complements Cashmores' coil slitting, polishing, and cut-to-length/leveling capabilities. The new Stanat Precision system is designed to de-burr stainless steel strip from 9.52mm (0.375") to 38.10mm (1.50") wide in gauges from 0.38mm (.015") to 2.48mm (.098") thick. The strip can be ribbon wound or rewound into an oscillated traverse wound coil up to 305mm (12") wide, weighing up to 1820 kg (4,000 lb.). The system will process coils at speeds up to 305 meters/mm (1,000 FPM). The new Stanat system enables Cashmores to offer its customers slit edge or edge conditioned coils with many times the linear strip footage as would be possible with conventional "ribbon wound" coils. 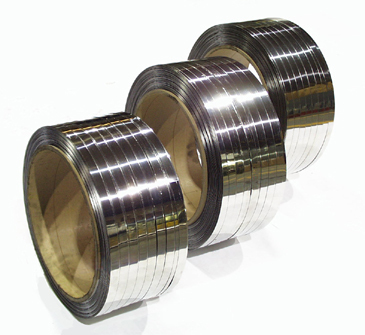 The additional strip length within each coil will improve Cashmores customer's operating efficiency by greatly reducing production downtime related to coil changeover. 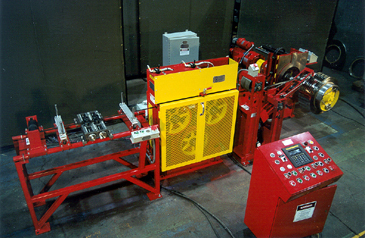 The Stanat Precision system includes a coil payoff (designed to handle multiple ribbon wound coils), a flash welder-strip end joiner (joins multiple ribbon wound coils), a multiple roller die de-burring unit, a variable speed drive bridle (provides strip tension for de-burring), and the traverse winder. The traverse winder is equipped with 406mm and 508mm (16" & 20") mandrels designed to produce ribbon and traverse coils wound on cardboard cores. The mandrel is supported on a shifting base that allows the mandrel to traverse from side to side to form traverse wound coils. The DC motor powered mandrel drive has a variable tension control that allows the formation of solid traverse wound coils. A servomotor controlled by a microprocessor motion control shifts the traverse winder from side to side. The operator enters gauge, strip width, finished coil width, strip gap, helix angle, stagger, and dwell, via keypad and message display to produce various size and density traverse wound coils. 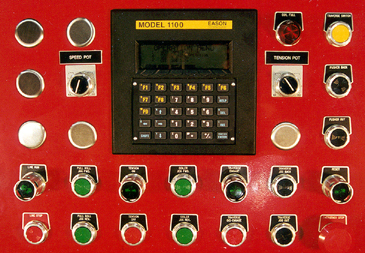 Data prompts make the control system easy to use and operator friendly. In addition, an extensive job databank is provided for recalling parameters from previously run jobs, eliminating job set-up time.